Company offers heat-treating processes from single parts to large volume orders from 40-foot vessels to small bleeder screws to deliver the best service possible to customers. 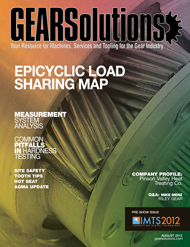 In this paper, the concept of an Epicyclic Load Sharing Map (ELSM) will be explained. The ELSM is a physics-based tool that is derived from a physical explanation of the load-sharing phenomenon. A Gage R&R study is used to quantify the inherent variation of all components compromising the measurement system selected for a task. As summer temperatures reach record highs, a host of safety concerns deserve attention to prevent accidents or illness while working with machinery.